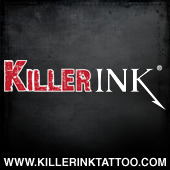 By joining Tattoos By Design Library area you get full access to over 2000 images, full sized. The £11 fee (around $19USD) covers you for a full year with no other costs involved. Once joined you can view full images larger and print them off for personal use. Access to the library willb e given withn 24 hours of signup. Refunds will not be given due to the nature of the content, you may cancel your subscription at any point by emailing us. It is illegal to reproduce/distribute or copy art produced by a professional artist without the permission of the copyright owner. For personal use only. To view this image of Evil Psycho Clown Thug full size you need to join the club using the form above, it's $19 USD for 12 months online access to over 2000 tattoo designs. *Images are not sold individually.